In the build up to Japan's attempt to capture and occupy Papua New Guinea the ability of the allies to quickly bring supplies from Australia was seen as a huge concern. As preparations for the attack on Papua New Guinea intensified it was decided to employ Japanese shinobi in a daring sabotage mission against the Australian mainland. 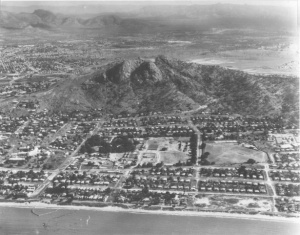 Townsville being the closest large port to Papua New Guinea was chosen as the first target. The plan was simple a highly trained group of shinobi would be inserted at dusk into the port through the use of traditional kite methods and would be extracted through the use of flying boats at dawn. Once in the port they would destroy as much equipment and kill as many important personnel as possible before escaping. If successful, it was thought that similar operations around Australia would first damage important infrastructure that would take time to repair, but also would cause large amounts of men and materials being dedicated to defense of the ports making the attack on Papua New Guinea an easy matter. The operation ran into trouble from the start, while the flight into Australia went off without a hitch, strong winds meant that the shinobi landed far from the intended target. This meant that an in and out operation conducted in a single night would be impossible. However, since the flying boats were already airborne by this time they did not get any information of this setback and were sitting ducks in the bay when dawn broke. 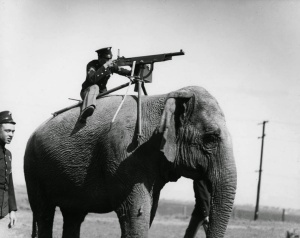 The Shinobi attempting to reach the target as soon as possible ran into a group of Australian cavalry training with experimental tactics, these including using animals such as elephants and kangaroos. 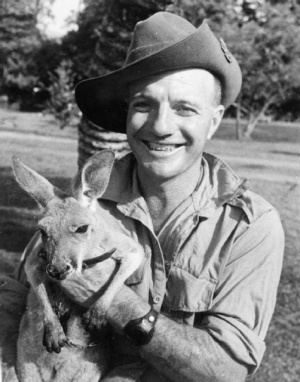 Due to the dense jungle nature of Papua New Guinea it was thought by the Australians that employing such animals against the Japanese would help stop the string of defeats that had seen the fall of Singapore and Dutch East Indies. 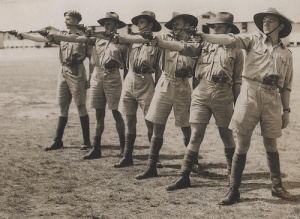 The battle that ensued between these unconventionally armed Australians and elite Japanese Shinobi is among the most interesting in WWII history. Trained since birth in the art of evading and quickly killing people, the Shinobi were at a loss at how to deal with an angry kangaroo wearing gloves covered in razor wire and elephants with machine guns and heavy mortars on their backs. Along with these animals was also a group of highly trained Australian cavalry. These were men who had been born in the outback and were tough as nails. While the soldiers on the Australian side where seasoned fighters they had no experience dealing with Shinobi. The battle started when one of the Shinobi was discovered by a kangaroo and was attacked. The Shinobi quickly swept the legs of the kangaroo, however it quickly used its tail to kick the Shinobi in the chest, knocking him out. Due to the noise, humans were quick on the scene and the Japanese agent was captured. The integration was quick with the Shinobi giving up everything he knew as long as they promised to kill him and tell everyone he died fighting an entire company. With the newly gained knowledge, the leader of the Australian cavalry decided to track the rest of the Japanese before they could cause any damage. Figuring out they were being tracked by skilled professionals and that escape was impossible, the Japaneses decided to make a stand and fight. The battle that ensued was described as the most bizarre event in history, and in the end all the Shinobi were killed along will most of the Australian force. With the failure of the initial attempt, Japanese command decided not to attempt another such raid, and instead decided that they would attack the Solomon Islands first in order to secure the waters between Papua New Guinea and northern Australia. 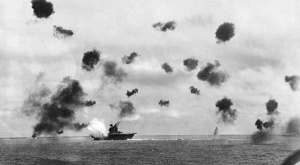 The capture Solomon Islands ended in success for the Japanese; however Japanese attempt to clear the water south of the Solomons resulted in the Battle of Coral Sea, in which the Japanese lost a carrier with another severely damaged, forcing them to withdraw closer to land bases. This allowed supplies to continue to flow between Australia and Papua New Guinea, strengthening the Allied positions in the Pacific. The Austrian survivors would later go on to form the Z special unit, an elite unit specializing crazy attacks and general purpose shenanigans. Using skills learned in their battle with the Japanese shinobi, they would go on to pull off such daring raids as sneaking into Singapore harbor, and sinking Japanese shipping in the middle of the harbor. On the one year anniversary of the battle of Townsville, in honor of the men who had died fighting to protect the town Z special unit decided to stage a practice raid against the harbor. However, they neglected to mention this practice raid to the Townsville authorities; in spite of this their raid was successful and none of the commandos were caught. On the formation of the unit it was decided that the true nature of the formation would be classified, due to fears that the families of the japanese shinobi might try to hunt down the survivors. Only recently with the 70 year anniversary of the end of WWII approaching has the true nature of the formation of Z special unit been declassified.